For those of you having problems to decide upon certain questions (“should I get this tatoo?”, “am I stupid?”, “Will you answer this question with NO?” Yes/No? 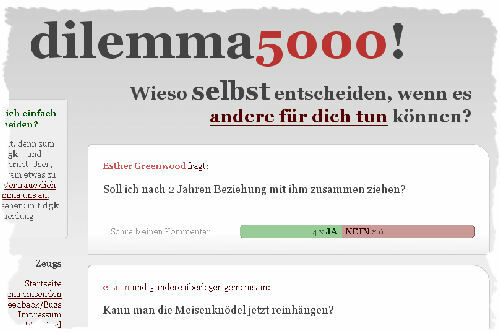 ), the german speaking web 2.0 world has come one step closer in sharing this difficult task: Dilemma 5000. Their tagline: “Why should you decide for yourself if others can do that for you?”. True.